In 1971, at a time when all of Raymond’s students in Grades 1-12 attended school in double sessions in one cramped building, Ellen Small, fresh out of the University of New Hampshire, joined the faculty as a fifth and sixth grade science teacher. 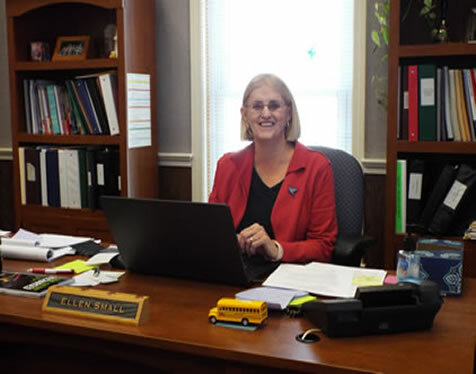 The Raymond School District and SAU (School Administrative Unit) 33 became home to her, and on June 30, she will retire from the post of superintendent. Small’s teaching career has focused primarily on science and middle school. After about two years in her first job, she taught sixth and seventh grade science for three years. When Lamprey River Elementary School opened, she taught there for a year, and then returned to the middle school as a science teacher. After taking four years off to be at home with her three sons, she came back to the middle school full time to teach seventh and eighth grade science. Fifteen years ago she was named assistant principal of the middle school, a post she held for five years. She served as its principal for the next five years, and completes her fifth year as superintendent on June 30. Small said she had all the credits needed to be certified as a superintendent but had never asked the state for certification until being asked to take the job. “I hadn’t planned on becoming a superintendent,” she said. A Candia resident, Small comes from a Navy family, and moved around a lot on the East Coast. In retirement, she plans to remain in Candia. Small said the remodeling and addition to the middle school several years ago was the biggest change she has seen in the school district. “Sections of the old building were nearly 100 years old,” she recalled. “It was wood frame, and parts of it were not suitable to use anymore. We had a huge building committee that worked for five years to get the new school. “Building that school was a turning point for the town,” she said. “It was an acknowledgement that we have good schools, and it brought more people into town. “We’ve come a long way,” Small said of the school district. “When I started, I was in a regular classroom, and science was not important in middle school – it was like an extra. I’m proud that I brought science to the level it is now – we have labs, not just reading a book and doing worksheets. Small is pleased that she was allowed to design a science room for the middle school after Raymond High School was built. “We went from out-of-date books to microscopes and lab equipment – and a sink,” she said. And noting that when children learn a foreign language at home, they don’t use books or software, she is proud that the middle school now offers two classes in Spanish. Small also helped develop the Raymond Roundtables program at the middle school with the summer school director at Phillips Exeter Academy in Exeter. That summer academic enrichment program has meshed with the Reach High Scholars program at Raymond High School. She said the district’s parents have been supportive of school programs, and the school board works for the benefit of the students. But she also looks forward to spending more time with her eight grandchildren and attending their activities. She hopes she and her husband will travel, and she plans to be away in August when school starts for the new year to help with her adjustment. She also enjoys biking and quilting, and said she has been asked to be an adjunct professor and may look into that path.